the hollow muscular organ lying slightly to the left of the midline of the chest. The heart serves as a pump controlling the blood flow in two circuits, the pulmonary and the systemic. See also circulatory system, and see Plates. Divisions of the Heart. The septum, a thick muscular wall, divides the heart into right and left halves. Each half is again divided into upper and lower quarters or chambers. The lower chambers are called ventricles and the upper chambers are called atria. The right side of the heart, consisting of the right atrium and right ventricle, receives deoxygenated blood and sends it into the pulmonary circuit. The left side, consisting of the left atrium and left ventricle, receives oxygenated blood and sends it into the systemic circuit. Valves of the Heart. 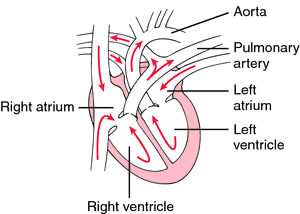 The atrioventricular valves connect an atrium and a ventricle: between the right atrium and right ventricle is the tricuspid valve and between the left atrium and left ventricle is the mitral valve. The semilunar valves are valves at the blood's exit points from the heart: the pulmonary valve opens from the right ventricle into the pulmonary artery, and the aortic valve opens from the left ventricle into the aorta. These valves, both within the heart and leading out of it, open and shut in such a way as to keep the blood flowing in one direction through the heart's two separate pairs of chambers: fro atrium to ventricle and out through its appropriate artery. Layers of the Heart. The heart wall is composed of three layers of tissues. Its chambers are lined by a delicate membrane, the endocardium. The thick muscular wall essential to normal pumping action of the heart is called the myocardium. The thin but sturdy membranous sac surrounding the exterior of the heart is called the pericardium. The Heart's Pacemaker. The heart is made up of special muscle tissue, capable of continuous rhythmic contraction without tiring. The impulse that starts the contraction of the heart has its origin in an area of the right atrium called the sinoatrial node; it is this special tissue that acts as the normal pacemaker for the heart. The impulse is transmitted in a fraction of a second through the atria to another group of similarly sensitive fibers called the atrioventricular node, through the bundle of his, down the bundle branches, and to the Purkinje fibers, resulting in contraction of the ventricles. Pumping Action. Although the right and left sides of the heart serve two separate branches of the circulation, each with its distinct function, they are coordinated so that the heart efficiently serves both sides with a single pumping action. The valve action on both sides is also coordinated with the two phases of the pumping action. Thus during diastole, the relaxation phase, oxygen-poor blood returning from the systemic circulation and accumulated in the right atrium pours into the right ventricle. 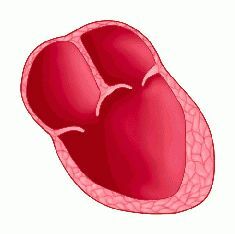 At the same time, the oxygen-rich blood that has accumulated in the left atrium returning from the pulmonary circulation pours into the left ventricle. The walls of both atria contract to press blood into the relaxed ventricles. In the next contraction phase (systole), the valves between the atria and ventricles close and the ventricles contract, forcing the blood through the pulmonary artery and the aorta. At the end of the contraction the pulmonary and aortic valves snap shut, preventing any backward flow of the blood into the ventricles. Diastole follows, the ventricles again filling with the blood from their respective atria, and the cycle is repeated. Disorders of the Heart. The heart is subject to a variety of disorders. Among them are congenital heart defects, which begin or exist at the time of birth. Disorders of this nature may interfere with the flow of the blood both within the heart and from the heart to the lungs. tetralogy of fallot and patent ductus arteriosus are examples of congenital heart defects. Rheumatic heart disease may be associated with rheumatic fever. Other disorders of the heart include angina pectoris, which is caused by coronary insufficiency; myocardial infarction, which results from formation of a blood clot in a coronary artery and death of myocardial tissue; and heart failure. Cardiac arrhythmias are disturbances in the normal rate and rhythm of the heartbeat. Diagnostic Tests. Many different diagnostic procedures are available for the examination of the heart. Along with a history and physical examination, an electrocardiogram (ECG) is routinely obtained. It shows a tracing of the electrical excitation that spreads through the heart during each beat. It is the definitive source of information about cardiac arrhythmias, and also gives diagnostic information about myocardial infarctions. Exercise stress testing is a valuable tool for detecting persons who have some degree of coronary heart disease. The test subject performs maximal exercise while being monitored by ECG. A positive stress test occurs when the subject cannot sustain the exercise for the duration of the test, cannot attain a normal maximal heart rate, or shows ECG changes indicative of ischemia. When stress testing is used for screening purposes, it is not diagnostic. However, persons with a positive stress test are 13 times more likely to develop significant coronary artery or heart disease and should work to reduce their risk factors. Stress testing is also used to evaluate the severity of known coronary disease and to guide the rehabilitation of a patient with coronary disease. Phonocardiography is the recording of heart sounds and murmurs. It is more precise than auscultation with a stethoscope because it provides a permanent visual record that can be used to obtain precise timing information and can be used as baseline data for comparison with later findings. Echocardiography is a type of diagnostic ultrasonography that provides information about the structure and function of the heart. It is a comfortable technique for the patient and is capable of establishing a diagnosis for several types of heart disease, especially those involving the valves. Types include M-mode, Doppler, and transesophageal echocardiography. Several types of radioisotope examination are used to detect heart disease. A radioisotope imaging agent is injected into the patient, and a scintillation camera is then used to make an image of the distribution of radioactivity. Thallium 201 has an affinity for heart tissue; when injected intravenously, it is carried to areas with adequate perfusion. Myocardial infarcts and areas of acute ischemia or scarring appear as “cold spots” (areas of no uptake of thallium) on the scintigram. When the isotope is injected during maximal exercise in an exercise stress test, the scan shows areas of inadequate perfusion and is a better indicator of coronary disease than a stress test alone. Radiopharmaceuticals that label the blood pool can be used with a computerized scintillation camera to evaluate ventricular performance. Images of the first pass of the radioisotope through the heart can be used to determine the cardiac output and ejection fraction, the size of the ventricles, and regional wall motion. The imaging agents used for bone scans, such as technetium 99m pyrophosphate or diphosphonate, also have an affinity for areas of acute ischemic tissue damage. “Hot spots” on the scintigram (areas of isotope uptake) show areas of acute infarction. The scan is usually negative by approximately 6 days after an infarction. Cardiac catheterization is an invasive technique used when definitive data are required to decide whether heart disease should be treated medically, surgically, or through interventional cardiology techniques such as percutaneous transluminal angioplasty, stents, or valvuloplasty. A catheter is inserted into a vein or artery, usually the brachial artery or the femoral vein or artery, and guided into the heart. Tracings of the pressure pulses within the chambers during the heart cycle are obtained. Cardiac output, pulmonary artery pressures, the orifice area of valves, and the degree of left-to-right shunting can be determined. Angiocardiography is the x-ray examination of the heart after injection of a radiopaque contrast medium through a catheter at various locations in the heart. The films show the size and motion of the heart chambers and can demonstrate aortic or mitral regurgitation. In coronary arteriography the contrast medium is injected through a catheter into the orifice of each coronary artery. The films show atherosclerotic obstructions of the arteries and are useful in planning coronary bypass surgery, percutaneous transluminal angioplasty, or stents. Prevention of Heart Disease. Although heart disease remains the leading cause of death in industrialized countries, its mortality rate has steadily declined since the early 1970s. A major factor in this decline is the development of more effective preventive measures and modes of treatment for ischemic heart disease. These advances include open heart surgery to repair congenital defects and replace malfunctioning valves; vascular surgery to repair or bypass obstructions in the coronary arteries and aorta; newer and more accurate diagnostic tests and procedures for detecting problems involving the heart and blood vessels; antimicrobial therapy for the treatment of rheumatic fever, syphilis, and other infectious diseases that are damaging to the heart; more sophisticated monitoring equipment and intensive care units; and aggressive medical treatment and management of heart disease and hypertension. All these contributions to the control and correction of cardiovascular diseases are important in the reduction of mortality rates and improvement in patients' quality of life. Nevertheless, it is also important for prevention that there be an improvement of the general public's awareness of the causes and risk factors of cardiac disorders. Major risk factors that can be avoided, modified, or corrected include cigarette smoking, elevated blood lipids, obesity, habitual dietary excesses, lack of exercise, hypertension, and excessive stress. Health professionals can promote reduction in the incidence of heart disease by educating the public about these risk factors and by encouraging active participation in preventive measures, particularly in those that involve changes in lifestyle. Blood enters the right atrium from the body and then passes into the right ventricle, where it is pumped into the lungs. It returns from the lungs into the right atrium. It enters the left ventricle and then is pumped to the body via the aorta. A hollow muscular organ that receives the blood from the veins and propels it into the arteries. In mammals it is divided by a musculomembranous septum into two halves-right or venous and left or arterial-each of which consists of a receiving chamber (atrium) and an ejecting chamber (ventricle). (hahrt) cor; the viscus of cardiac muscle that maintains the circulation of the blood. artificial heart a pumping mechanism that duplicates the rate, output, and blood pressure of the natural heart; it may replace the function of a part or all of the heart. athletic heart hypertrophy of the heart without valvular disease, sometimes seen in athletes. extracorporeal heart an artificial heart located outside the body and usually performing pumping and oxygenating functions. 1. one that has undergone fatty degeneration. 2. a condition in which fat has accumulated around and in the heart muscle. fibroid heart one in which fibrous tissue replaces portions of the myocardium, such as may occur in chronic myocarditis. horizontal heart a counterclockwise rotation of the electrical axis (deviation to the left) of the heart. left heart the left atrium and ventricle, which propel the blood through the systemic circulation. right heart the right atrium and ventricle, which propel the venous blood into the pulmonary circulation. stone heart massive contraction band necrosis in an irreversibly noncompliant hypertrophied heart, occurring as a complication of cardiac surgery; believed due to low levels of ATP and to calcium overload. three-chambered heart a developmental anomaly in which the heart is missing the interventricular or interatrial septum and so has only three compartments. Three-chambered heart in which the interventricular septum is absent (common ventricle). water-bottle heart a radiographic sign of pericardial effusion, in which the cardiopericardial silhouette is enlarged and assumes the shape of a flask or water bottle. 1. The chambered muscular organ in vertebrates that pumps blood received from the veins into the arteries, thereby maintaining the flow of blood through the entire circulatory system. In humans it has four chambers. 2. A similarly functioning structure in invertebrates. the muscular cone-shaped hollow organ, about the size of a clenched fist, that pumps blood throughout the body and beats normally about 70 times per minute by coordinated nerve impulses and muscular contractions. Enclosed in pericardium, it rests on the diaphragm between the lower borders of the lungs, occupying the middle of the mediastinum. It is covered ventrally by the sternum and the adjoining parts of the third to the sixth costal cartilages. The organ is about 12 cm long, 8 cm wide at its broadest part, and 6 cm thick. The weight of the heart in men averages between 280 and 340 g and in women, between 230 and 280 g. The layers of the heart, starting from the outside, are the epicardium, the myocardium, and the endocardium. The chambers include two ventricles with thick muscular walls, making up the bulk of the organ, and two atria with thin muscular walls. A septum separates the ventricles and extends between the atria (interatrial septum), dividing the heart into the right and the left sides. The left side of the heart pumps oxygenated blood into the aorta and on to all parts of the body. The right side receives deoxygenated blood from the vena cava and pumps it into the pulmonary arteries. The valves of the heart include the tricuspid valve, the bicuspid (mitral) valve, the semilunar aortic valve, and the semilunar pulmonary valve. The sinoatrial node in the right atrium of the heart (under the control of the medulla oblongata in the brainstem) initiates the cardiac impulse, causing the atria to contract. The atrioventricular (AV) node near the septal wall of the right atrium spreads the impulse over the AV bundle (bundle of His) and its branches, causing the ventricles to contract. Both atria contract simultaneously, followed quickly by the simultaneous contraction of the ventricles. The sinoatrial node of the heartbeat sets the rate. Other factors affecting the heartbeat are emotion, exercise, hormones, temperature, pain, and stress. See also endocardium, epicardium, heart valve, myocardium. See Abiomed implantable heart, Athlete's heart, Baby Fae heart, Bleeding heart, Crisscross heart, Dextroposition heart, Depraved heart, Egg-shaped heart, Flabby heart, Flask-shaped heart, Holiday heart, Left heart, Mongolian heart, Old soldier's heart, Penn State heart, Right heart, Sabot heart, Second heart, Stone heart, Swinging heart, Water bottle heart. A hollow muscular organ that receives the blood from the veins and propels it into the arteries. It is divided by a musculomembranous septum into two halves (right or venous and left or arterial) each of which consists of a receiving chamber (atrium) and an ejecting chamber (ventricle). Synonym(s): cor [TA] , coeur. The upper right and left atria are thin-walled receiving chambers separated by the interatrial septum. The lower right and left ventricles are thick-walled pumping chambers separated by the interventricular septum; normally the right side has no communication with the left. The right side receives deoxygenated blood via the venae cavae from the body and pumps it to the lungs; the left side receives oxygenated blood from the lungs and pumps it via the aorta and arteries to the body. Contraction of the heart chambers is called systole; relaxation with accompanying filling with blood is called diastole. The sequence of events that occurs in a single heartbeat is called the cardiac cycle, with atrial systole followed by ventricular systole. For a heart rate of 70 beats per minute, each cycle lasts about 0.85 sec. In the healthy state, all four cardiac valves prevent backflow of blood. The atrioventricular valves are at the openings between each atrium and ventricle; the tricuspid valve, between the right atrium and ventricle; and the bicuspid or mitral valve, between the left atrium and ventricle. The pulmonary semilunar valve is at the opening of the right ventricle into the pulmonary artery; the aortic semilunar valve is at the opening of the left ventricle into the aorta. In adults, the cardiac output varies from 5 L/min at rest to as much as 20 L/min during vigorous exercise. At the rate of 72 times each minute, the adult human heart beats 104,000 times a day, 38,000,000 times a year. Every stroke forces approx. 5 cu in (82 ml) of blood out into the body, amounting to 500,000 cu in (8193 L) a day. In terms of work, this is the equivalent of raising 1 ton (907 kg) to a height of 41 ft (12.5 m) every 24 hr. The myocardium receives its blood supply from the coronary arteries that arise from the ascending aorta. Blood from the myocardium drains into several cardiac veins. The heart initiates its own beat, usually from 60 to 80 beats per minute, but the rate may be changed by impulses from the cardiac centers in the medulla oblongata. Accelerator impulses are carried by sympathetic nerves. Preganglionic neurons in the thoracic spinal cord synapse with postganglionic neurons in the cervical ganglia of the sympathetic trunk; their axons continue to the heart. Sympathetic impulses are transmitted to the sinoatrial (SA) node, atrioventricular (AV) node, bundle of His, and myocardium of the ventricles and increase heart rate and force of contraction. Inhibitory impulses are carried by the vagus nerves (parasympathetic). Preganglionic neurons (vagus) originating in the medulla synapse with postganglionic neurons in terminal ganglia in the wall of the heart. Parasympathetic impulses are transmitted to the SA and AV nodes and decrease the heart rate. Sensory nerves from the heart serve for the sensation of pain, which is caused by an insufficient supply of oxygen to the myocardium. The vagus and glossopharyngeal are the sensory nerves for reflex changes in heart rate. These nerves arise from pressoreceptors or chemoreceptors in the aortic arch and carotid sinus, respectively. Listening to the heart with a stethoscope reveals the intensity, quality, and rhythm of the heart sounds and detects any adventitious sounds (e.g., murmurs or pericardial friction). The two separate sounds heard by the use of a stethoscope over the heart have been represented by the syllables “lubb, ” “dupp.” The first sound (systolic), which is prolonged and dull, results from the contraction of the ventricle, tension of the atrioventricular valves, and the impact of the heart against the chest wall and is synchronous with the apex beat and carotid pulse. The first sound is followed by a short pause, and then the second sound (diastolic) is heard, resulting from the closure of the aortic and pulmonary valves. This sound is short and high pitched. After the second sound there is a longer pause before the first is heard again. A very useful technique for listening to the variation in sounds between one area and another is to move the stethoscope in small steps from site to site. The patient should be recumbent when the examination begins. After all possible signs have been elicited, the examination should be repeated with the patient sitting, standing, or leaning forward, and any variations from this change of position should be noted. Auscultation is performed first while the patient is breathing naturally, next while he holds the breath in both deep inspiration and expiration, and finally while the patient takes three or four forced inspirations. By listening over the entire thoracic cavity, the examiner should try to localize the points at which heart sounds, both normal and abnormal, are heard with the greatest intensity. The examination should proceed from below upward and from left to right. The normal location of valves should be noted for auscultation. The aortic valve is in the third intercostal space, close to the left side of the sternum; the pulmonary valve is in front of the aorta, behind the junction of the third costal cartilage with the sternum, on the left side. The tricuspid valve is located behind the middle of the sternum about the level of the fourth costal cartilage. Finally, the mitral valve is behind the third intercostal space about 1 in (2.5 cm) to the left of the sternum. Both heart sounds either are heard better or are actually accentuated in increased heart action from any cause, normal or abnormal (e.g., anemia, vigorous exercise, cardiac hypertrophy, thin chest walls, and lung consolidation as found in pneumonia). Accentuation of the aortic second sound results from hypertrophy of the left ventricle, increased arterial resistance (as in arteriosclerosis with hypertension), or aortic aneurysm. Accentuation of the pulmonary second sound results from pulmonary obstruction (as in emphysema, pneumonia, or hypertrophy of the right ventricle). Both heart sounds are poorly heard or are actually decreased in intensity in general obesity, general debility, degeneration or dilatation of the heart, pericardial or pleural effusion, and emphysema. The reduplication of heart sounds is probably due to a lack of synchronous action in the valves of both sides of the heart. It results from many conditions but notably from increased resistance in the systemic or the pulmonary circulation (as in arteriosclerosis and emphysema). It is also frequently noted in mitral stenosis and pericarditis. A murmur (an abnormal sound heard over the heart or blood vessels) may result from obstruction or regurgitation at the valves following endocarditis; dilatation of the ventricle or relaxation of its walls rendering the valves relatively insufficient; aneurysm; a change in the blood constituents (as in anemia); roughening of the pericardial surfaces (as in pericarditis); and irregular action of the heart. Murmurs produced within the heart are called endocardial; those outside, exocardial; those produced in aneurysms, bruits; those produced by anemia, hemic murmurs. Hemic murmurs, which are soft and blowing and usually systolic, are heard best over the pulmonary valves. They are associated with symptoms of anemia. An aneurysmal murmur (bruit) is usually loud and booming, systolic, and heard best over the aorta or base of the heart. It is often associated with an abnormal area of dullness and pulsation and with symptoms resulting from pressure on neighboring structures. Pericardial friction sounds are superficial, rough, and creaking, to and fro in tempo, and not transmitted beyond the precordium. These sounds may be modified by the pressure of the stethoscope. Murmur intensity and configuration: The intensity (loudness) of murmurs may be graded from I to VI as follows: (1) Grade I–faint, audible only with intense listening in a quiet environment; (2) Grade II–quiet but immediately audible; (3) Grade III–moderately loud; (4) Grade IV–quite loud; a thrill (like the purring of a cat) usually felt over the heart; (5) Grade V–loud enough to be heard with the stethoscope not completely in contact with the chest wall; and (6) Grade VI–loud enough to be heard with the stethoscope close to but not actually touching the chest. The configuration of sound intensity of a murmur may begin low and rise in intensity (crescendo) or be relatively loud and then decrease in intensity (decrescendo) or some combination of those features or may exhibit the same intensity from beginning to end. This process not only determines position, force, extent, and rhythm of the apex beat but also detects any fremitus or thrill. A thrill is a vibratory sensation like that when the hand is placed on the back of a purring cat. Thrills at the base of the heart may result from valvular lesions, atheroma of the aorta, aneurysm, and roughened pericardial surfaces (as in pericarditis). A presystolic thrill at the apex is almost pathognomonic of mitral stenosis. In children especially, a precordial bulge, substernal thrust, or apical heave suggests cardiac enlargement. This procedure determines the shape and extent of cardiac dullness. The normal area of superficial or absolute percussion dullness (the part uncovered by the lung) is detected by light percussion and extends from the fourth left costosternal junction to the apex beat; from the apex beat to the juncture of the xiphoid cartilage with the sternum; and thence up the left border of the sternum. The normal area of deep percussion dullness (the heart projected on the chest wall) is detected by firm percussion and extends from the third left costosternal articulation to the apex beat; from the apex beat to the junction of the xiphoid cartilage with the sternum; and thence up the right border of sternum to the third rib. The lower level of cardiac dullness fuses with the liver dullness and can rarely be determined. The area of cardiac dullness is increased in hypertrophy and dilation of the heart and in pericardial effusion; it is diminished in emphysema, pneumothorax, and pneumocardium. A heart displaced into the abdominal cavity. An obsolete term for calcific pericarditis. A mechanical device that pumps blood to augment or replace a failing heart. It may be located inside the body (intracorporeally) or outside it (extracorporeally). Enlargement of the heart (cardiomegaly), with slowing of the heart rate (bradycardia) as a result of prolonged physical training, e.g., the aerobic exercise of running. This is not known to be a predisposing factor for any form of heart disease. Synonym: athletic bradycardia. Heart failure caused by thiamine (vitamin B1) deficiency (e.g., in patients with chronic alcoholism or malnutrition). A heart in which one ventricle is dilated and hypertrophied as a result of aortic regurgitation. A heart with calcified patches in its walls and pericardium (e.g., in patients with hyperparathyroidism). A heart displaced into the neck. An obsolete term for scarring of the myocardium (e.g., after myocardial infarction). An obsolete term for neurocirculatory asthenia or effort syndrome, characterized by breathlessness, palpitation, weakness, and exhaustion. The left atrium and ventricle. The left atrium receives oxygenated blood from the lungs; the left ventricle pumps this blood into the systemic circulation. The right atrium and ventricle. The right atrium receives deoxygenated blood from the body; the right ventricle pumps this blood to the lungs. An obsolete term for panic attack. The twin-sided, four-chambered controlled muscular pump that, by means of regular rhythmical tightening (contractions) of the chambers and the action of valves, maintains the twin circulations of blood to the lungs and to the rest of the body. 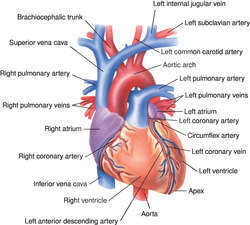 The right side of the heart pumps blood through the lungs and back to the left side. The left side pumps the blood returning from the lungs through all parts of the body and back to the right side. Fig. 189 Heart . Nerve centres in the mammalian heart. the right side pumps blood around the pulmonary (lung) circulation for oxygenation, the left side pumping blood around the systemic (body) circulation where it becomes deoxygenated. blood from the body enters the right atrium via the superior vena cava (upper body) and inferior vena cava (lower body). A coronary sinus also drains into the right atrium bringing blood from the heart itself. The right atrium squeezes blood through the atrioventricular (AV) opening into the muscular right ventricle. finally, blood is ejected into the single opening of the pulmonary artery which splits to go to the two lungs. 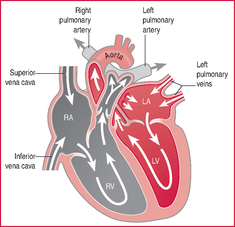 blood enters the left atrium from four pulmonary veins and passes through the left AV opening into the left ventricle. This has a much thicker wall than the right ventricle, reflecting its requirement for greater power. Blood leaves the left ventricle by one great vessel, the AORTA, which supplies all parts of the body, including the heart. flow of blood through the heart is in one direction only, due to the presence of various valves. Back-flow from ventricles to atria is prevented by AV valves, the tricuspid valve on the right side with three flaps, and the BICUSPID (3) valve on the left side with two flaps, both valves held in place by cords of connective tissue, the ‘chordae tendinae’. Back-flow from arteries to the ventricles is prevented by semilunar valves. various nerve areas connected with contraction are located in the heart (see HEART, CARDIAC CYCLE): (i) the sinoatrial node (SAN) or ‘pacemaker’ located in the wall of the right atrium near the entry of the venae cavae; (ii) the atrioventricular node (AVN) at the junction of all four heart chambers; (iii) the atrioventricular bundle, or bundle of His, running down the interventricular septum from the AVN; and (iv) a network of Purkinje tissue and other fibres spreading out from the bundle of His across the walls of both ventricles. See Fig. 189 . Other nerve areas are situated in or near the heart: (i) baroreceptors in the walls of the heart, in the aortic arch, the carotid sinus, venae cavae and pulmonary veins where they enter the atria. Such sensory receptors are stimulated by stretching of the structure in which they are found, resulting in a decrease in blood pressure. (ii) chemoreceptors sensitive to blood CO2 levels are found in the AORTIC BODY and CAROTID BODY. Blood flow through the heart. 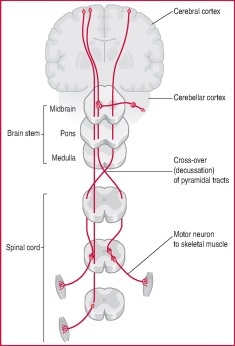 Figure 1: The sites of the main nerve centres and descending pathways in the brain and spinal cord that control voluntary movement, represented in diagrammatic sections. four-chambered organ, receiving venous blood from the systemic circulation into the right atrium, passing it on to the right ventricle to be pumped through the lungs in the pulmonary circulation; oxygenated blood in the pulmonary veins enters the left atrium and thence to the left ventricle, to be pumped out in the aorta to all systemic arteries. Valves control the direction of flow. The myocardium (cardiac muscle) forms the walls of the chambers which are lined by the endocardium. The heart is contained within the membranous pericardium. See also cardiac cycle; Figure 1. Hollow muscular organ that receives blood from veins and propels it into the arteries. In mammals, divided by a musculomembranous septum into two halves-right or venous and left or arterial-each of which consists of a receiving chamber (atrium) and an ejecting chamber (ventricle). n the muscular pump that maintains and regulates the flow of blood through the body. n a mechanical device that acts to pump blood to and from the body tissues during repair of the heart. n See myocardial infarction; thrombosis, coronary; or occlusion, coronary. n the condition in which the muscular interconnection between the auricle and ventricle is interrupted so that the auricle and ventricle beat independently of each other. n a fault in the structural integrity of the heart. n the structural errors in the heart formed during embryonic and fetal life. n a disorder in the normal functioning of the heart. n.pl the special considerations taken to eliminate oral disease by maintaining an elevated level of oral health and prevent infective endocarditis, an infection of the heart valves that may be caused by bacteremia created during dental treatments. Heart disease has also been linked with increased levels of periodontal disease. n See disease, heart, ischemic. n.pl the hereditary, lifestyle, and environmental influences that increase one's chances of developing heart disease. n the sound of blood flowing back through a defective heart valve. Two types are possible: organic or functional. n a heart without anatomic defects that could cause an impairment in the function of the organ. n the rate or tempo of heart contractions recorded in beats per minute. n.pl the normal noises produced within the heart during the cardiac cycle that can be heard over the precordium and may reveal abnormalities in cardiac structure or function. The use of the stethoscope over the left side of the chest is a common clinical technique to assess heart function. The typical sounds are a rythmic lub dup; abnormal sounds include clicks, murmurs, rubs, snaps, and gallops. n a surgical procedure involving the heart, performed to correct acquired or congenital defects, to replace diseased valves, to open or bypass blocked vessels, or to graft a prosthesis or a transplant in place. n.pl one of the four structures within the heart that prevent backflow of blood by opening and closing with each heartbeat. 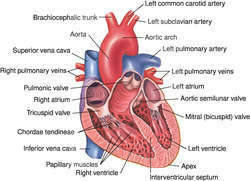 They include two semilunar valves, the aortic and pulmonary; the mitral, or bicuspid, valve; and the tricuspid valve. They permit the flow of blood in only one direction, and any one of the valves may become defective, permitting the backflow associated with heart murmurs. the hollow muscular organ lying on the sternum that serves as a pump controlling the blood flow in two circuits, the pulmonary and the systemic. See also circulatory system. a mechanical device that replaces the heart by using pulsating air to pump blood to the body. Successfully placed in calves, sheep and dogs as experimental models for the subsequent use of such methods in humans. ossicles in the fibrous skeletal ring which surrounds the aortic orifice of the heart in cattle and occasionally in other species; called also ossa cordis. consists of the sinoatrial node, the atrioventricular node, the atrioventricular bundle and its two crura. insufficient oxygenated hemoglobin is received in the peripheral capillary beds resulting in blue discoloration of tissues, and an incapacity of the body to maintain a life-sustaining level of activity. an all-embracing term including those diseases in which there is intrinsic disease of the heart such as uremia, valvular disease, African horse sickness, vitamin E-selenium nutritional deficiency, inherited cardiomyopathies of dogs and cattle, altitude sickness, canine parvovirus infection, and in a number of plant and other poisonings. See also mulberry heart disease. hemosiderin-laden macrophages present in the pulmonary alveoli in cases of congestive heart failure. includes ectopia cordis, patent foramen ovale, ventricular septal defects such as Fallot's tetralogy, Eisenmenger complex, patent ductus arteriosus, aortic coarctation, right aortic arch persistence, truncus arteriosus persistence, fibroelastosis, subvalvular aortic stenosis, anomalous origin of carotid arteries, transposition of great vessels, pulmonic stenosis, aortic stenosis. acupuncture points along the heart meridian. the number of contractions of the cardiac ventricles per unit of time. For normal rates see pulse rate. a concept which sets out that performance in racing horses is related to heart size, now a well-established relationship, and that heart size can be estimated in the living horse by the measurement of the QRS interval. see heart sounds, heart murmur. is an unpopular concept in any medical science but overtrained horses which perform poorly do have a high incidence of abnormal T waves. failure of complete development of atrioventricular or semilunar valves results in stenosis or incompetence of the valves and often congestive heart failure. congenital, usually multiple lesions on the edges of atrioventricular valves, mostly in calves; disappear spontaneously in most cases. common lesion on the free edges of valves, often the source of widespread emboli; on healing leave scarred, insufficient valves. flaps of endothelial connective tissue that guard the entrance into and exit from the ventricles and bring about unidirectional blood flow. Include the atrioventricular and semilunar valves, the proper closure of which is essential to maintain circulatory equilibrium, can be diseased and cause heart failure. See also heart murmur, endocarditis, endocardiosis. A. Heart problems may manifest as sensation of the heartbeats (called palpitations, as with rhythm problems), chest pain (usually a feeling of tightness or pressure in the chest rather than frank pain), or difficulty breathing (called dyspnea). Other manifestations may include fainting (called syncope) either spontaneously or after exercise, edema (swelling) of the legs and various other non specific complaints. Q. What happens to my heart when I exercise? My senior told me that exercise is good for health and especially for heart. What happens to my heart when I exercise? A. the heart is a muscle that constructs and pump blood through our body. like any muscle it can get bigger and stronger. doing exercise is putting pressure on the heart and the heart start to react by growing. Q. Is garlic helpful in heart ailments? I have heard that garlic is very good for cardiac health and using in curries or cooked with foods will be helpful. I have also heard that it has anti-inflammatory substances and also helps in weight loss. Is garlic helpful in heart ailments? A. It acts as antioxidant and reduces the amount of free radicals in your body. It’s helpful once taken raw. But the raw garlic can cause bad breadth and blistering of skin and diarrhea. So, there should be a reduced intake of raw garlic. It’s better to have garlic in a cooked up form like in curries or with vegetables. This will also give the desired benefits of garlic and the side effect of over consumption of garlic will also be reduced. Taking part in the race will enable Mr Percival to fulfil a dream and raise money for a charity close to heart. But what cannot be denied, isthat there is a huge lack of practical business experience among the MSPs, which can sometimes make it difficult to explain the importance of issues close to heart of the small business community. The IGP further said that the techniques and approach adopted by the police to trace the real culprits was very much professional, convincing and close to hearts and said that the whole nation was appreciating the professional capabilities of Buner police in this case which also convey clear message to the criminals that they will not escape by taking the law into their hands. A number of the club's creditors have been informed of the latest developments and sources close to Hearts expect a hearing to take place within the "next couple of days". This would make it impossible to influence Lankan behaviour particularly with regard to the fishermen issue, close to hearts of all Tamil politicians in India.